When I was a little girl, I was always in appointments for various medical problems. Some teeth to be removed there. Some bones to be straightened here. And some bladder issues to be worked out over there. After appointments, my mom and I would stop by White Spot where I'd poke away at my food until I could order dessert. And I'd always choose the same one: the glorious hot fudge brownie sundae. I loved the way the warm brownie melted the ice cream around the edges. I loved the way the fudge cascaded its way across all dessert borders. But most of all, I loved how this big plate of chocolate and ice cream could somehow make everything melt away, and for a few minutes I could just enjoy being a kid in the way that only a giant, toppling dessert can bring. I don't know when I stopped ordering it, but lately I've been craving that comfort. This at-home version has everything I remember, but all in a single serve package. 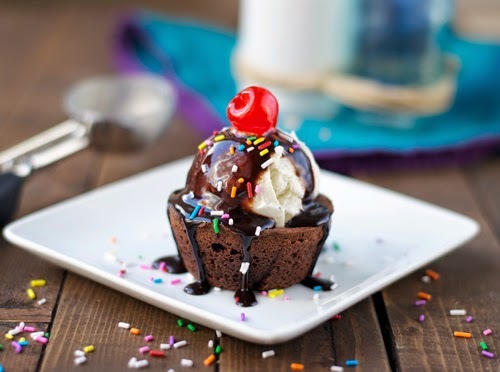 The brownies are cooked individually (like those horribly addictive two-bite brownies), and topped with a big scoop of ice cream, some thick fudge, and a dash of sprinkles. Oh, and a cherry on top. Preheat oven to 350F, and grease a muffin tin. Set aside. Combine the butter, sugars, cocoa, and eggs and beat until smooth and glossy. Add in the flour, baking powder, and vanilla until well combined. Stir in the chocolate chips. Spoon the batter into the muffin pans and bake for 7-13 minutes. Allow to cool slightly. 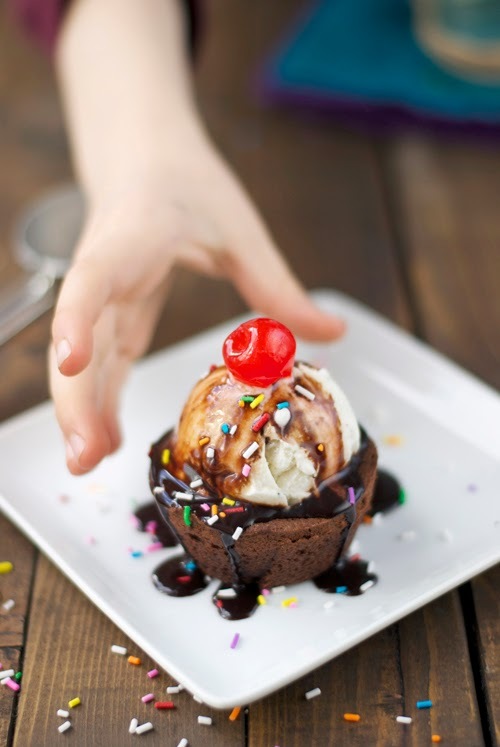 When ready to serve, scoop ice cream on top of the brownie, drizzle with fudge sauce, and then top with sprinkles and a maraschino cherry.